The superalloy cobalt is one of only three naturally occurring magnetic metals, along with iron and nickel and has long been valued for its colour and its versatile properties – it’s rust resistant and retains its properties at high temperatures. Ancient civilisations used cobalt in ceramics and glass, and more recently its use has been predominantly in the manufacture of magnetic, wear-resistant and high-strength alloys. Yet cobalt has never seen anything like the attention it’s getting currently. That is because cobalt is now recognised as an essential material in the manufacture of rechargeable lithium-ion batteries. These are the batteries used in all of today’s most innovative technologies – electric cars, smartphones, and laptops made by companies such as Apple, Panasonic and Samsung. Just ask the powers that be at car giant Tesla, how important cobalt is to their operations. The saying, ‘ no cobalt, no Tesla ’ may well be accurate. It’s a big call, but there is no doubt cobalt is crucial to Tesla’s ambitions. Yet, this rapidly growing market requires a ramp up in cobalt production if growth is to continue at current rates. A major problem for battery manufacturers is that approximately 60% of cobalt is mined in the Democratic Republic of Congo. Manufacturers, including Tesla, are also under pressure from shareholders to find sources of cobalt outside of the DRC. That’s because the industry in the DRC has an appalling human rights record with injuries and deaths common as is child labour. For that reason there is strong demand for cobalt from alternative locations. Experts anticipate a 15% decrease in cobalt supply in 2016 as a consequence of mines being shut and more ethical controls put in place. Supply is tightening and demand is soaring especially from the lithium ion battery sector, meaning there’s a chance cobalt prices will rise from current levels. What you probably don’t know about cobalt is that there’s a tiny ASX-listed company that has quietly acquired a license for a significant cobalt prospect near Broken Hill in NSW. All of the projects of the company we are introducing to you today are on domestic soil – a smart move that mitigates the sovereign risk surrounding foreign sources of cobalt, such as the DRC. Potential investors should note that AYR is still in early stage exploration mode and therefore any decision with regards to adding this stock to your portfolio should be taken with caution and professional financial advice sought. Broken Hill – considered the heartland of NSW mining – is believed to contain one of the largest undeveloped cobalt reserves in the world. This is where the company’s main project, the Great Goulburn Copper-Gold Prospect, is located. It recently started field programs and designed an exploration program to test for extensions to a known cobalt-gold mineralisation. With RC drilling set to commence in late January, just weeks from now, we should get some indication very soon as to what the fruits of its efforts may be. It recently undertook a successful capital raise which brought in $1.25 million towards project generation at Broken Hill as well as the continuing development of its Western Australian gold JV – a handy injection of cash which could carry this small cap through several key steps on both fronts. Both WA and Broken Hill are solid places to be exploring – and the targeted metals, cobalt and gold, could both prove to be well worth the effort in the coming years. Today’s ASX-listed hopeful is more than just a single-minded, yet potentially lucrative play. Taking a two-pronged approach to diversify its operations by keeping a significant hand in the gold game, while focusing heavily on cobalt, could help with both resilience and longevity. With a market cap of just $7.7 million today, there remains ample room to grow. Before we delve any further, let’s give this cobalt-gold explorer a name. Alloy Resources Limited (ASX:AYR) is now looking to capitalise on the fruits of several strategically-paced years of careful positioning across Australia. Its game plan involves taking the fast-track from early stage explorer, to JORC compliant resource definition and pre-feasibility studies as soon as possible. Aircore drilling on its WA gold project has just been completed, identifying three large anomalous gold trends with JV partner Doray Minerals. Meanwhile a magnetic exploration survey has begun at its Ophara cobalt project in NSW, in the lead up to drilling in the near term. Importantly, AYR seem to be on the right track – and it’s better to get on board an early stage project heading along a promising course, than an advanced one heading in the wrong direction. Should AYR capitalise on its current momentum and the upcoming opportunities to garner support for the projects it has humming away, its growth could be exponential. AYR would be buoyed by Cobalt Blue’s recent IPO, with shares in that company set to commence trading on 31 January after a heavily oversubscribed capital raising understood to raise around $10M, with a likely market cap at listing of around $20M. With that investment, Cobalt Blue, a wholly owned subsidiary of Broken Hill Prospecting, is set to fast track its Thackaringa Cobalt Project in Broken Hill. Broken Hill Prospecting has more than doubled the global Mineral Resource inventory and it now comprises a total inferred estimate of 33.1 million tonnes at 833bpm . Mineralised outcrop extends over 10km, with less than a quarter drill tested. AYR’s projects are not only in close proximity to Thackaringa, but as AYR is at an earlier stage, it’s still valued under $10M. The company will also be looking to put its own exploration on the fast track to take advantage of macro developments. There’s still plenty of work to be done, however, but so far the early indicators of success at both of AYR’s main projects are positive. If just one of these projects lands the kind of resource AYR is aiming for, the company could see soaring valuations in a relatively short space of time, particularly when you consider a few other market comparisons. AYR’s mineralisation style is similar to Havilah Resources (ASX: HAV)’s Mutooroo deposit 10km to the south west of AYR – HAV’s market cap is over $100M. While Corazon Mining (ASX:CZN), which holds just a 51% interest in a project within the Mt Gilmore region, has seen a 260% share price rise in the past 12 months. 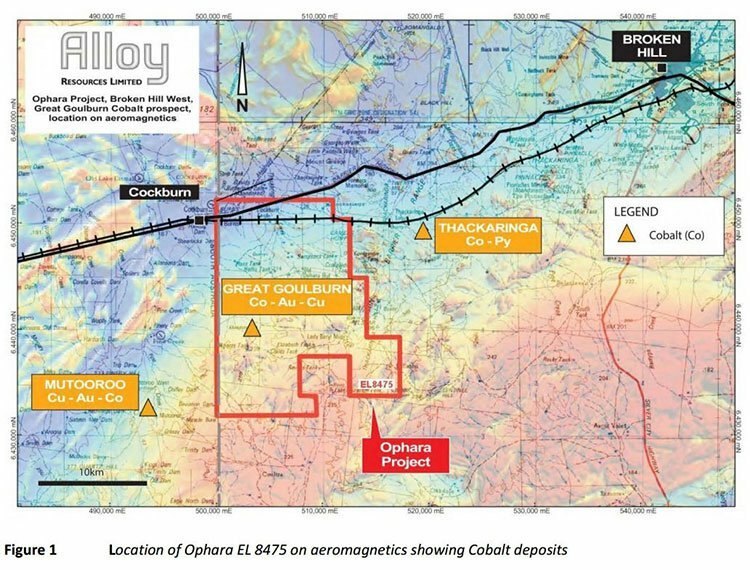 Let’s run through a summary of AYR’s Ophara cobalt project. 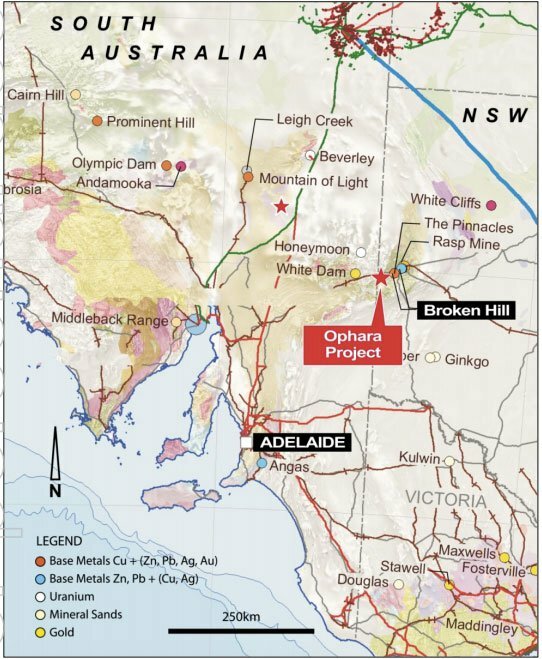 Located 50km west of Broken Hill is AYR’s 100% owned Ophara project, which contains the Great Goulburn cobalt-gold prospect. Development reached a milestone in October with AYR granted a project license and land access agreements were signed for the Ophara project with local Pastoral Lease owners. 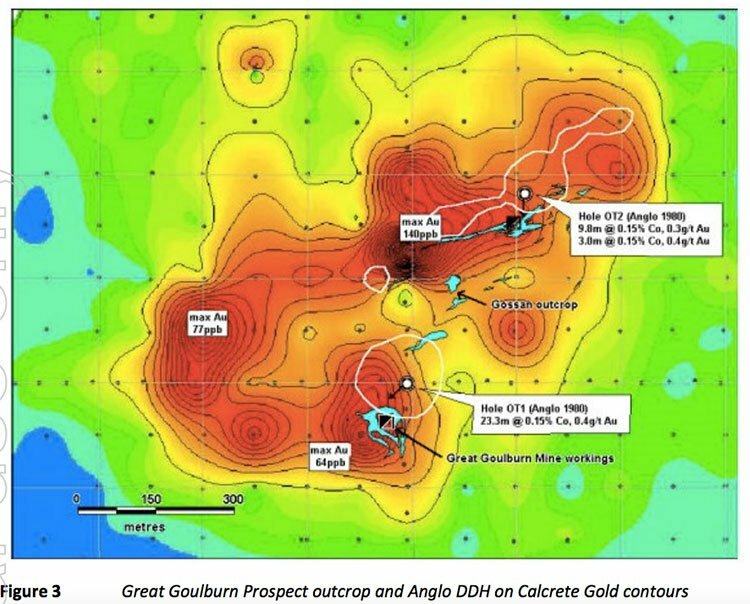 Wasting no time at all, the company announced in December it was kicking off exploration activities across a 6km by 2km area surrounding the Great Goulburn prospect in order to define how far the mineralisation extends . A ground magnetic survey will be completed, as well as a soil sampling program, with exploration designed specifically to define new drilling targets beyond the known mineralisation. Importantly, plans for RC drill testing are well advanced, with drilling expected to begin in late January. 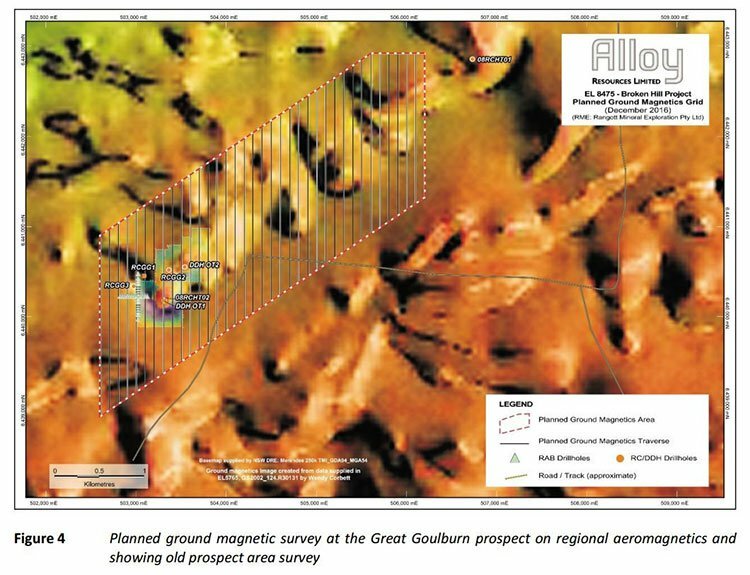 As stated above, AYR has plans to commence RC drill testing of the area in late January – but these plans will be finalised based on the ground magnetic work happening right now. Extensive historical surface rock-chip sampling confirms mineralisation with maximum values of 0.9% cobalt and 2.3 g/t Gold . The site has a bit of a history – two small shafts were excavated back in the 1890s by someone who obviously had a similar hunch about the existence of precious elements. Then in 1981, modern testing was done via two short diamond drill holes showing the following grades at 3 different areas and levels – Cobalt: 0.138% Co, 0.145% Co and 0.153% Co; Copper: 581 ppm Cu, 694 ppm Cu and 247 ppm Cu; and Gold: 0.393g/t Au, 0.307g/t Au, 0.359g/t Au. Exploration has also shown unique gold-rich cobalt mineralisation hosted in a quartz-magnetite rock unit. This is similar to $100 million capped Havilah Resources’ Mutooroo deposit 10km south-west of the project site. To put it simply, the above information means AYR has a fairly good idea of where to start looking for cobalt and gold mineralisation, and with cash in the bank, is not wasting anytime in getting to work and hopefully adding value for shareholders in the near term. As touched on earlier, cobalt and gold are both enjoying higher than usual levels of demand. Cobalt is gaining attention as it is a core material in lithium-ion batteries – an attribute most useful in energy turbines, aircraft and motors (it’s so resilient it’s even used in space craft). The Ophara project area is a known area for cobalt mineralisation in the southern Curnamona Craton. Through the company’s research, it’s discovered indicators that the Great Goulburn prospect is a replacement style deposit associated with a quartz-magnetite (BIF) stratigraphic unit. The location certainly won’t hurt as far as establishing a skilled workforce, access to amenities and transportation when the time comes for mining. Past drilling results for cobalt at Great Goulburn returned significantly higher grades than the Thackargina deposits. Results also indicate the cobalt mineralisation at Ophara is not part of a large low-priority copper-gold resource, as with Mutooroo (a factor that could limit development and production of cobalt). Yet the prospect has similarities to both of these cobalt deposits in terms of promising a significant Resource... so why has cobalt mining not been seriously attempted here before? Historically, cobalt was not a focus for past explorers who were primarily on the hunt for iron and copper. However, some exploration work of the area was completed by a Joint Venture between PlatSearch and Inco Limited in the early 2000s which defined 20 prospects for further work. But, little follow-up has been completed since then – until now. Planning to smash the past record of only six historical drill holes in the last 30 years, AYR intend to get cracking on finding out where and how much cobalt lies within Ophara. The company is explicitly aiming to extend the strike length through sampling and geophysics in the coming months. What we’re really looking at here is a highly prospective bit of land that has only had half a dozen drill holes... perhaps lying in wait until a company like AYR saw a chance to capitalise on the shift towards a post-fossil fuels, battery-powered future with an insatiable hunger for cobalt. Cobalt is needed in the newest generations of rechargeable lithium-ion batteries – some are comprised of 60% cobalt (by cathode mass). These batteries are vital for electric cars, laptops and mobile phones. Unfortunately, a large amount of cobalt available today comes from developing countries where the mining of the metal contributes to extensive and bloody conflicts. But that’s likely to change, with alternative sources being demanded by consumers – which is exactly where viable, competitive new plays can enter and make their mark – making way for the new breed of aspiring companies wanting to ride on the coat tails of the EV commodities boom. You can bet Tesla are wanting to source metals from areas without conflict, so that they can keep the endorsement of ethical, environmental and social investors and funds. The electric vehicle manufacturer, along with Apple and other tech giants are scrambling to defend the sourcing of metals from conflict zones . A safer cobalt source, like AYR’s Ophara prospect, could be exactly the answer the EV movement is desperate for. 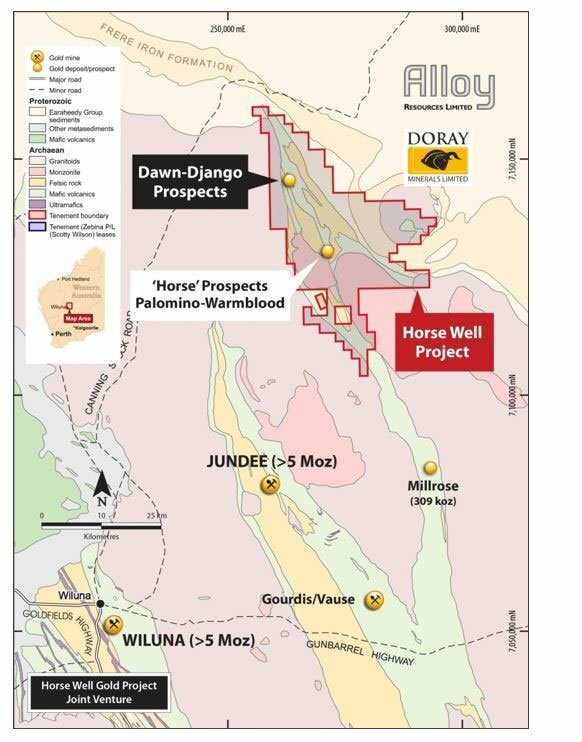 AYR is looking to move quickly on its newest cobalt play, but it isn’t losing sight of its existing projects... in particular, its promising Horse Well gold prospect in WA. While cobalt is the moment’s hot commodity, good old gold has been simmering away for some time. Over the past three years the gold price has risen 17%, helped along by the geo-political uncertainty of Brexit and uncertainty surrounding the election of Donald Trump as US President. Of course, commodity prices can fluctuate quickly, and caution should be applied to any investment decision here and not be based on spot prices alone. Seek professional financial advice before choosing to invest. AYR is looking at a 40% chunk of a highly prospective 1000km 2 gold project in WA – and the key news is that drilling has already commenced. The Horse Well joint venture is anticipating it will define and recover 1 million ounces of gold. If all goes to plan, investors might very well get the ‘next big gold story’ they are hoping for. If AYR and its JV partner Doray Minerals (ASX:DRM) can delineate a 1 million ounce gold reserve, it could become a 100 koz per annum standalone operation. As drilling is already underway, investors should expect news flow soon. 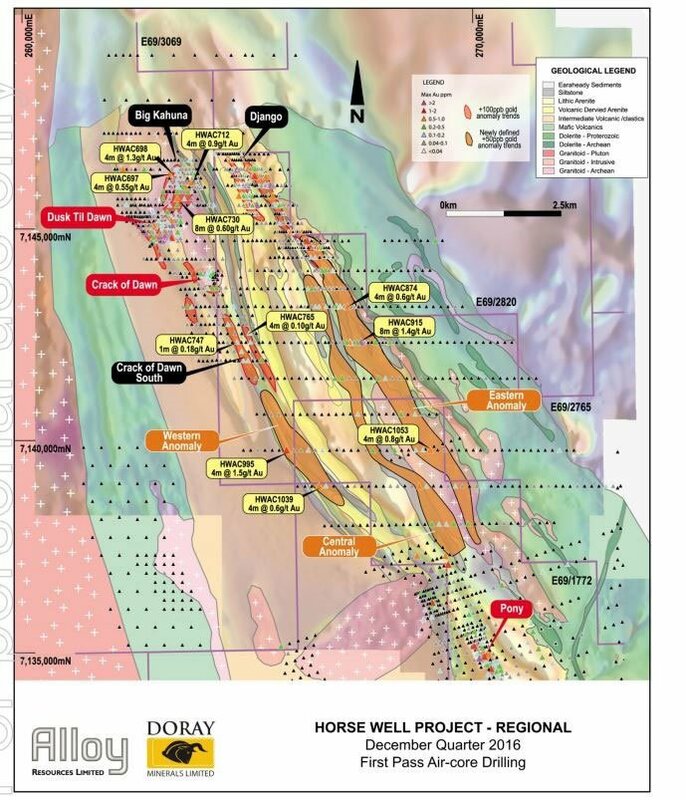 Doray Minerals is 60% owner of the Horse Well project (with a good track record when it comes to exploration, to boot) with AYR holding a solid 40% interest. This gives AYR exposure to the project without relying too heavily on its success. Recently, AYR released results from the major program of air-core exploration drilling completed at the Horse Well in late 2016 from the final 390 holes totalling 23,637 metres. The first pass drilling across approximately 7.5 kilometres’ strike of greenstone belt has been successful in defining new extensive gold anomalies through the area south of the Django prospect down to historical drilling at the Pony prospect. In the central portion of the belt at the junction of western metasedimentary rocks with eastern mafic rocks, a large suite of granite has intruded. This junction is also thought to be structural in nature and is interpreted to be the location of the Celia shear. Gold mineralisation is intimately associated with this junction and two parallel 6 and 7-kilometre-long continuous anomalous trends occur in this area. Anomalies are defined as + 50 ppb Au due to the very wide spacing of the first pass drilling at 800m x 160m. The presence of the granite intrusives was unexpected and offers a compelling target for gold mineralisation, which may be similar in nature to AYR’s Dusk til Dawn prospect. A third anomaly is located to the west and extends over three kilometres along the western contact of a siltstone unit. AYR and its JV partner Doray are currently planning follow up air core exploration drilling programmes to test these first pass widely spaced anomalies. Its Martins Well site in South Australia is prospective for copper and silver, with the main target being the Mammoth Black Ridge prospect – with outcropping siderite-sulphide gossans extending over a 1.5km strike. 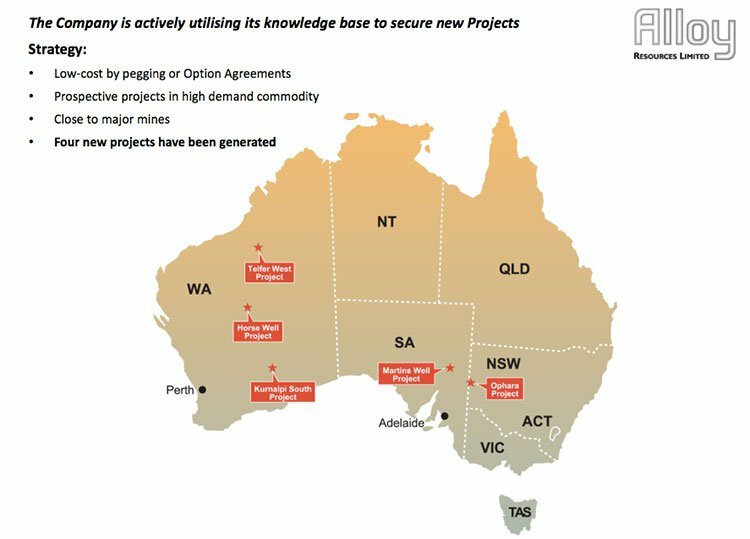 ... along with its prospect at Kurnalpi South, WA: a 190 km 2 exploration licence application located 60km east of Kalgoorlie. The target for exploration at this site is gold mineralisation, however the area is largely unexplored with limited soil sampling and air-core drilling. A few factors such as lake areas have historically precluded soil sampling. 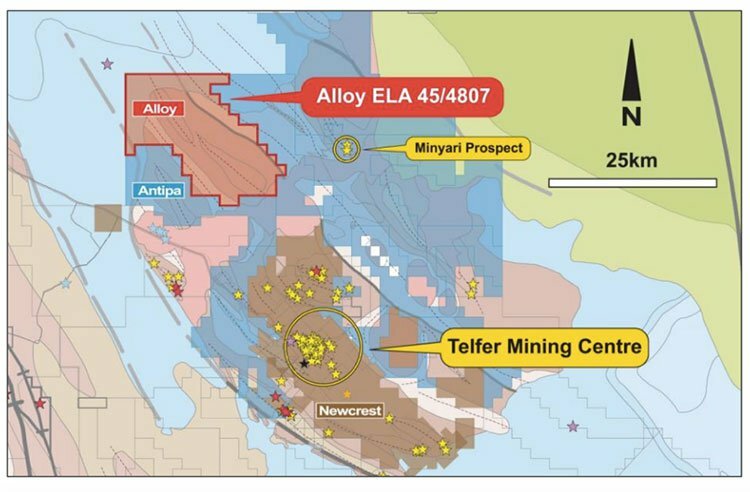 Lastly, AYR holds a large 368km 2 exploration licence application at Telfer West, also in WA – a project prospective for both gold and copper, just 15km west of Antipa Minerals Minyari Gold Prospect. BHP and Gindalbie Gold undertook limited air-core drilling in the 1990s which located anomalous copper (0.26%) and gold (0.23 g/t) over a 5km strike. It’s another opportunity to be kept warm on the backburner while AYR first look to play their Ace cards (Ophara and Horse Well). The company currently holds around $1.6M in cash, which you might expect will see it through the first half of 2017. On 12 December 2016 shareholders approved a share placement of 250 million ordinary fully paid shares, and 20 million unlisted options exercisable at 1 cent per share, expiring on 19 December 2019. The share placement was announced on ASX on 8 November 2016 and approved at the General Meeting on 12 December. The placement brought in $1.25 million before costs – an impressive show of confidence from existing and new sophisticated investors. Of course, part and parcel of all small cap stocks, at some stage, AYR will likely be looking to raise more capital one way or another as they progress to JORC, PFS and BFS on both the Horse Well gold play and the Ophara cobalt prospect – but AYR is hoping any new capital raise will come at a valuation much higher than today’s levels. The injection of funds from December’s cap raise probably came in at just the right time for the company who are keeping several balls in the air while completing necessary exploration work. There’s a lot of potential inherent in AYR’s current collection of holdings. It is still early stage exploration, however and success is never a guarantee, so investors should use this article in conjunction with all publicly available information before making an investment decision with regard to this stock. The company is in an advantageous position, keeping the Horse Well gold JV ticking along in the background while making headway in its 100% owned Broken Hill cobalt play. Over the coming weeks the company will likely know exactly where and when it can start drilling – a make or break time for any small cap explorer. Could tiny AYR be set for a gold rush or a one-way ticket to cobalt city? With the global metals market getting a vigorous workout in the race to manufacture ever more lithium-ion batteries, and enormous change on a global scale which includes celebrity politicians and negative interest rates making gold more attractive, it could well be the perfect time to build in some exposure to these two commodities. A strong background of several years’ work honing in on gold prospects in WA, combined with a new and potentially competitive cobalt play, could spell success. At any rate, there will be plenty of investors waiting to see how AYR can maximise on its two-pronged position from here, and go from small cap stock to ASX smash hit.